a traditional SAP Business One SDK developer, seeking to learn about modern application development with SAP HANA and Service Layer of SAP Business One, and build the next generation of loosely-coupled solution with SAP Fiori UX for small business? a functional consultant of SAP Business One having some real business cases from customer to be addressed through solution development? 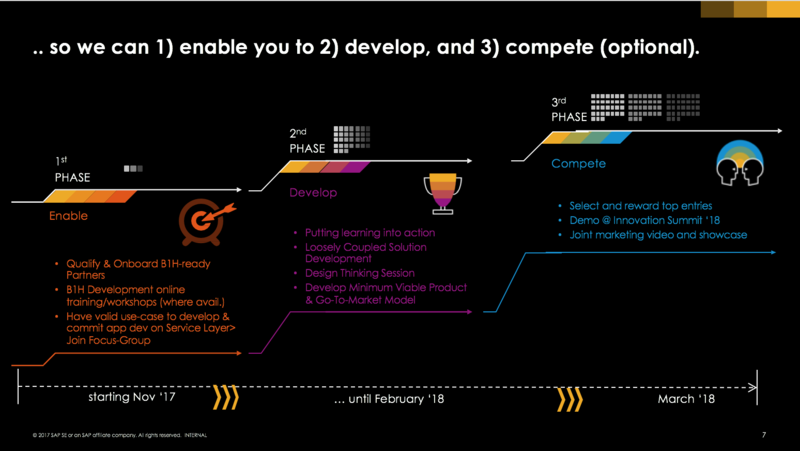 Join us in our inaugural SAP Business One APJ SEED Development Challenge Program. Register here: Registration for SAP Business One APJ SEED Development Challenge or email your SAP Business One Local Product Expert for registration. An initiative to flourish the next generation Application Development of SAP Business One powered by SAP HANA for Asia Pacific & Japan. A fun approach to learn cutting-edge technology for enterprise application development, interact and collaborate with peers. A great opportunity to win exclusive recognition of your solution at SAP Business One APJ Innovation Summit 2018, through individual marketing videos to showcase your solution to customers, SAP stakeholders and partners. The program will have three Phases through November 2017 to March 2018. The developer course is running on the basis of the standard Application Development online course of SAP Business One version for SAP HANA on SAP eLearning Hub in an openSAP course fashion, which you can join the focus group on registration with a private SAP Jam Group for discussion and communication. (Invited participants only). The participants will take the above online courses for 4 weeks with a scheduled time frame. Each week have its dedicated topics, every topic includes presentation video, exercise and solution. At the end week, a focus group call as Q&A session will be organised about the weekly topics. Each week may take 2~4 hours to complete the course. The syllabus of online developer training list below. You will turn your ideas into reality by developing an application with what you have learned, as well as fine tuning your use-case via Design Thinking. A SCN blog to introduce your application including the business case, persona of target user, solution overview, technical architecture etc. A demo video (not more than 3 minutes) pitch to showcase your solution. SAP will assess all the candidate app submission by the participants, and select the top entries to demonstrate in SAP Business One APJ Innovation Summit 2018. Further follow up with your Go-to-Market strategy afterwards. 1.Who can attend the SEED program? Only open to SAP Business One Partners (VAR, SSP, OEM, MVAR) in APJ countries. Check with your Local Product Expert if you are unsure. There is no special requirement for the target audience to join the SEED program, as the deliverable outcomes of the program is apps created by participants with the technology learned in the course to address some business cases. No worry if you are a functional consultant without a technical background, having a business case or application idea, you can seek developer peer to work out your application idea together. 2.What is Focus Group and what is so special about it? The Focus Group is a group of selected participants who are devoted to the SEED program with commitment to learning and app development. The focus group will be exclusively invited into a private SAP Jam Group for weekly follow up call and communication, or personalised Q&A and design thinking session if necessary. 3.What are the prerequisite to join the Focus Group? A B1H demo system ready for exercises and app development. A burning app use-case to be addressed through app development. And more importantly your eagerness to learn, and willingness to share and collaborate with peers. 4.How can I access the B1H HANA development online course? 5.Can I continue the learning even after Dec 15, 2017. Yes, you are free to revisit the course on your own pace even after the phase 1. 6.Can I just participate the online course for study without joining the development challenge? However, you may be excluded from the Focus Group of the SEED Program. 7.When is the deadline of App submission for the Development Challenge? 8.What are the criteria of App Submission? -SAP Fiori/SAPUI5 or Conversational UI as the User Experience. -(Optional)If applicable, SAP HANA Extensive Application Service(XS/XSA), Advanced Data Processing such as Predictive Analysis, Text Analysis, Spatial Processing, Graph etc. -(Optional)If applicable, SAP Cloud Platform, such as IoT Service, Predictive Service, Leonardo Machine Learning etc. More details about App Submission guideline is available in the jam group of the program. 9.What is the award for the winners of the Development Challenge? SAP may award the top entries to be demonstrated on SAP Business One APJ Innovation Summit 2018 as well as joint marketing videos to showcase the respective participant’s solution and its success. Furthermore, SAP may offer co-marketing activities to all qualified participants. 10.How to ask a technical question? Firstly, you should post the question on the forum of SAP Business One SDK Community with SAP Business One SDK as primary tag and add the user tag #b1helearning, hence the technical questions could be shared for the whole community, And the question will reaching out to the global SAP team monitoring the community. The questions will be answered in SCN forum. After that, please duplicate the same question into the SEED Forum based on the topics with the same title as the question title, the content as the url referring to the same question in SAP Business One SDK Community. Hence, all the SEED APJ community are able to share. All rights reserved by SAP SE. If SAP determines in its own discretion that a reasonable number of applications is not reached, SAP as the right to cancel the “SAP Business One APJ SEED Developer Challenge”. SAP has the right to alter any timeline (e.g. extending the application phase) and to change these Terms & Conditions at any time. SAP informs Partners about these changes via SCN or JAM.